A heartbroken mother has been told her son is dead, lost or in prison after he joined a migrant exodus from the region of Ethiopia hardest hit by drought. The east African country is being devastated by climate change after rains failed for more than a year, wiping out crop harvests and leaving 10.2 million people crying out for food aid. Hagosa Girmay, who looks well beyond her 40 years, clutched her fist to her heart as she thought of the proud farmer's son who fled three years ago for a better life in Saudi Arabia. Niguse Tesfay, now 20, has not sent a message home to their village of Asmut in the mountains of northern Tigray since he left. "We heard different stories - that he got lost on the way, there were rumours that he died on the way," she said. "Other people said that he survived but they couldn't keep track of him. I was even told that he is in prison in Saudi. "The worst thing is not knowing." 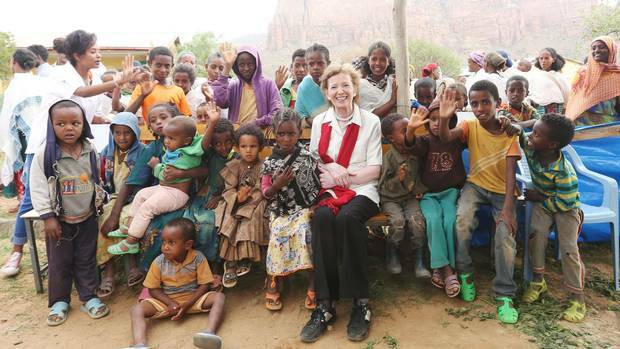 The grieving mother was among hundreds of villagers who gave UN envoy and former president of Ireland Mary Robinson a traditional welcome as she witnessed the arid lands where they struggle to grow enough food to live. Her anguish is only one among the millions who are suffering from increasingly-volatile climate shifts and the pain of migration. Her home is among the tiny terraced farm plots in the mountains of Ingal which straddle the border with Eritrea. A stalemate of neither war nor peace plays out along the loosely-marked divide, evidenced by a camouflaged battalion of 16 tanks stationed in nearby hills. Ms Robinson travelled to Tigray to see first hand the life-saving work done in nutrition clinics, seed distribution centres and development projects supported by Concern, Trocaire and Goal. Ethiopia is being compounded by the El Nino weather phenomenon in the Pacific, which radically alters rain patterns across the globe. Ultimately Ms Robinson is to use the experience in her role as UN envoy for climate change and El Nino to urge the international community to do more to combat the deepening crisis. Reflecting on her previous human rights role in the UN and the visit to Ethiopia, she said she had seen some of the worst inhumanity. "The things you see, they stay in your mind," she said. Vital rains have failed in Tigray for more than a year, leaving swathes of small farms and their thin soils bone dry and infertile. The region was the hardest hit province in the 1984 famine. Since March this year Ethiopia has suffered what is known as the "Hunger Season". On top of the 10.2 million in need of aid, eight million are already being given food and nutrient parcels every month, and the money needed from the international community to prevent severe malnutrition, mass starvation and death is short by £400 million (468 million euro). Officially only 70,000 people illegally flee Ethiopia a year, but research from 2013 put the figure at close to 50,000 for Tigray alone. The Arab kingdom has been destination number one for years. They flee through the port of Djibouti to Yemen and over the mountains or along the coast to Saudi, often by foot. Ms Girmay's already fragile existence is worsened by the loss of her son. "I am sad, but only sometimes, other times I have hope," she said through a translator. "Sometimes I am hopeless and all I can do is cry over it and try to get it out of my system. I'm close to giving up on getting him back home. "Sometimes I cry thinking that he's dead. There are times that I feel hopeful and I pray to God to return him. My feelings are confused." In the past they fled conflict and hunger for the hope of work abroad. Now they are escaping the worst drought that has hit the region in half a century.